Kochi: Coffee exports grew 8% over last year’s numbers for the first halfof fiscal 2009, and are on track to surpass last fiscal’s total, which was a record in value terms. The first half of fiscal 2009 saw 114,815 tonnes exported, compared with 106,244 tonnes during the same period last year, according to the industry. Earnings went up to $309 million (Rs1,449 crore today), 38% more than the $224 millionfor the same period last year. The increase was 1% less in rupee terms. The unit value realization went up to Rs112.43 a kg from Rs88.14. G.V. Krishna Rau, chairman of the Coffee Board of India, a government trade promotion body, says the board is confident of achieving the 220,000 tonnes export target set for this fiscal year. “It is expected that the export earnings this year both in dollar and rupee terms would be higher than the last fiscal year, that is, $502 million and Rs2,045 crore," he said. According to Ramesh Rajah, president of the Coffee Exporters’ Association of India, the quantity of domestic coffee exported is more or less thesame as last year. The incremental rise is through coffee imported from Vietnam, processed here and exported to Russia,he said. Between October 2007 and September, the total provisional value of coffee exports is estimated at $586 million, compared with $443 million during the previous year. The increase in rupee value for the period is estimated to be 27.5%, while the difference in unit value realization, from Rs84.60 a kg to Rs105, will likely be about 24%, Rajah added. 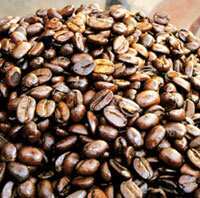 Of this, 44% came from the Robusta variety and 31% from instant coffee, also largely made from Robusta beans. Any fresh exports, however, will have to come from the new crop that should be ready by December since there is little coffee left from this year’s crop so far, and will be required to meet domestic demand, Raju said, adding that exports will likely only pick up in the last quarter of this fiscal. The price rise has proved beneficial for the industry, which had been reeling under a rupee appreciation till a few months ago, he said, but cautioned that any benefits of the depreciating rupee will likely be offset by the rate of inflation, the rise in fertilizer prices and higher freight charges on account of the rise in petroleum prices.